1. Alice in Wonderland White Rabbit Tea Cosy £50.00 [x] : The reality is I'm probably a little young to want a tea cosy. After all I'm not a granny quite yet, but hey I love Alice in Wonderland and this is just a little bit too adorable. Anyone own a tea cosy? Let me know down below! 2. Alice in Wonderland Rabbit Mug with Key Handle £15.00 [x] : I love the slightly vintage look of this Alice in Wonderland mug, and that key handle? Such an amazing touch. 3. 3 Easter Cookie Cutters £6.00 [x] : If you love a bit of spring baking these pretty pastel cookie cutters are perfect. They come in bunny, chick and flower easter egg shapes. 4. Bird Egg Cups Set Of Two £13.00 [x] : These bird egg cups come in a set of two in the colours yellow and pink, and green and white. 5. Easter Crackers £15.00 [x] : I didn't really know that Easter crackers were a thing, but I've fallen in love with this beautiful set of six from M&S. Each comes with a hat and an adorable Easter cookie cutter, so you can bake some Easter treats. 6. Rabbit Vase £19.50 [x] : I love this rabbit vase, and luckily it's not so novelty that you can't have it in your house all year round. Plus it has really cute details, like the cute bunny tail on the back. Tomorrow, I'm actually heading off to Japan and South Korea for TWO WEEKS! I'll be going to Tokyo, Kyoto, Seoul and Busan and it is going to be amazing. So I won't be as active on my blog but I'll still be posting at least a couple of times a week, so don't forget to visit. Thank you for reading lovelies! Let me know in the comment section below what you thought of this week's picks! I really like those egg cups, they're pastel which is my favourite! And I haven't heard of the Easter crackers too, but they look adorable so they're worth the shot. If my dog wasn't so scared of them I would definitely get the crackers, they are such a good idea! Also the egg cups are adorable! Aww, that's adorable. My dog hates loud noises too! And yes they are! Take LOTS of pictures please and have fun! As a super fan of Alice in Wonderland, I have to have #2! That is the cutest! I need it in my life too (I absolutely love Alice In Wonderland Homeware)! Some great picks here as per usual! 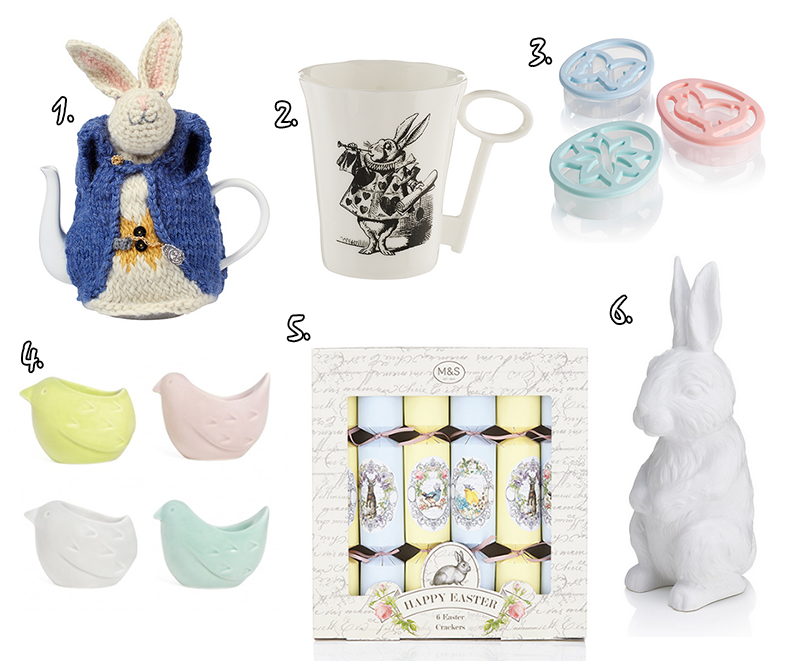 That white rabbit mug is perfect especially with the key as the handle!